You will love our tough Diamond Seal Delta faucets! Experience a faucet that performs like new for life with Delta DIAMOND Seal Technology. Their patented design reduces leak points and lasts twice as long as the industry standard ensuring leak-free operation for the life of the faucet. Everything you need is together in one convenient box, including integrated supply lines. Using diamonds, the hardest naturally-occurring substance on Earth, Delta engineered a faucet that’s longer lasting, leak-free and less hassle to install. 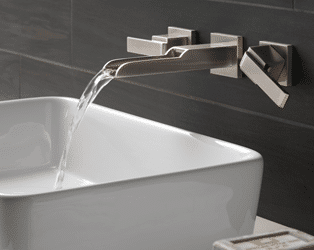 Who knew a faucet could be just as beautiful on the inside? Now that is Sierra Remodeling cool! From lavatory faucets to bathtub drains, toilets and shower heads to soap dispensers and other accessories, Delta has every fixture for the bathroom that holds up well against the hard Arizona water. Delta Touch2O Technology helps keep your bathroom clean by giving you three ways to operate your bathroom faucet: manually with the handle, with a simple touch anywhere on the spout or faucet handle, or by placing your hands near the faucet. The high-tech capacitance sensing capabilities of Touch2O faucets allow the flow of water to be activated by breaking the capacitance field anywhere around the device, unlike traditional hands-free infrared sensors which require your hands be in a particular place and are sensitive to lighting conditions and clothing and skin color. Delta SpotShield Technology helps to keep your faucet or shower cleaner, longer by resisting water spots and fingerprints. With the addition of antimicrobial protection of the finish, Spotshield Finishes also help to reduce stain—and odor—causing microbial growth on the faucet finish. The Delta Worry-Free Drain Catch is a simple solution to the common problem of pills, jewelry or other valuables washing down the drain. We simply slip the Worry-Free Drain Catch over the pop-up during installation and, you enjoy peace of mind knowing you’re protected from those “oops” moments. Who knew?! Delta WaterSense labeled faucets, showers and toilets use at least 20% less water than the industry standard—saving you money without compromising performance. In Sierra Vista and our surrounding communities water conservation is important! We also offer WaterSense labeled shower heads and hand showers that will coordinate with any décor style, from the intricate detail of traditional to the sleek lines of contemporary. This letter is in reference to Mr. Larry Jones whom is a carpenter that is employed by Sierra Remodeling. Mr. Larry Jones just recently installed kitchen cabinets and electrical lighting fixtures in my Mother’s town home that I am currently getting ready to sell. I had requested Mr. Larry Jones since I knew that I could trust him to do the job right, since he had installed wooden shutters in all the windows of my Mother’s town home several years ago. Mr. Larry Jones did a terrific job installing the cabinets and even found that the microwave, which had been installed from an unqualified electrician, had been installed incorrectly and that the wires were shorting out. Larry fixed the electrical problem, which was an electrical hazard. Larry is a great craftsman and I would recommend his work to anyone that needed cabinetry installed in their home. He is a true professional. 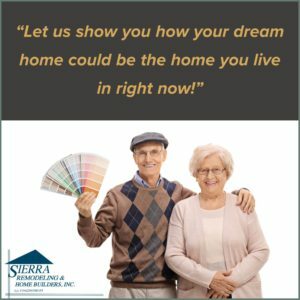 I would like to thank you (Sierra Remodeling) and your employees for helping me accomplish the job in a timely manner.